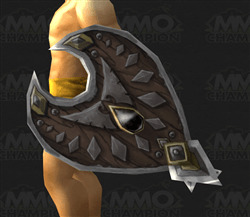 5.3 will apparently bring us the heirloom shields, effective up to level 85. That means (a) they are moot for my shield using Tanks which is a shame, but (b) my Shaman toy might get some bling. Well honestly I’ll probably buy both eventually anyway in the grim hope that one day another class is added. So make that 4350 Justice pts. And a pony. Good news though. It is something to spend Justice points on. This entry was posted in Gear, Warcraft and tagged heirloom, justice points, shields, world of warcraft by Typhoonandrew. Bookmark the permalink.